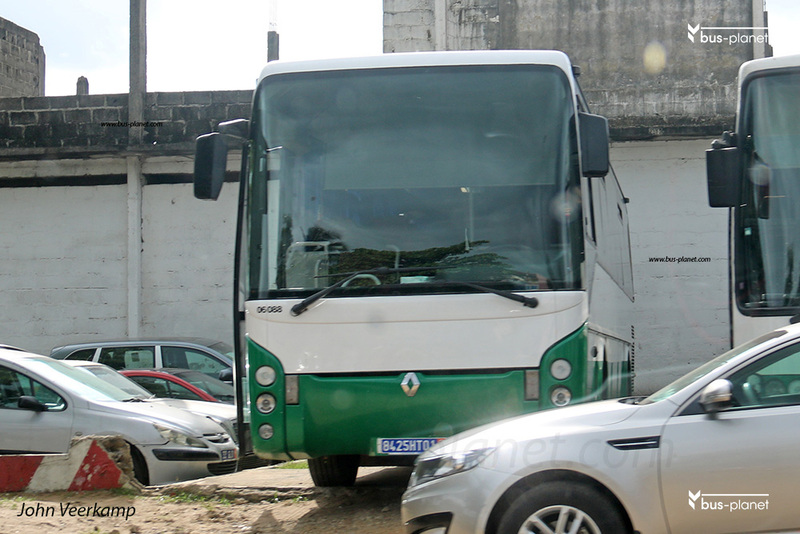 The Ares was developed by Renault as a coach/excursion bus with a rear engine. Production started in 1998. In 2002, when IVECO took over the Renault bus business, it became the Irisbus Ares. The most common version is 11.99 meters long, 2.55 meters wide and 3.42 high. The wheelbase is 6.2 meters. A 10.5 meter long version was introduced in 1998, a 12.8 meter version in 2004 and a three-axle 15 meter, 3.6 meter high version also in 2004. The latter was built in the former Karosa factory in Vysoké Mýto in the Czech Republic. The engine is the Renault MIDR 06.20.45 R41 302 HP Euro2 and later Euro 3 with ZF S6.85 manual or ZF 5 HP 590 automatic gearbox, or the same engine rated at 340 HP with a ZF 8S. 180 manual gearbox. Since 2002 the IVECO Cursor 8 engine was used. The Ares was not very popular, as it competed with several other Renault/Irisbus models. It was replaced by the Irisbus Arway. Picture(s) taken by John Veerkamp. Cote d'Ivoire. Abidjan. dd: 2017-11-04.